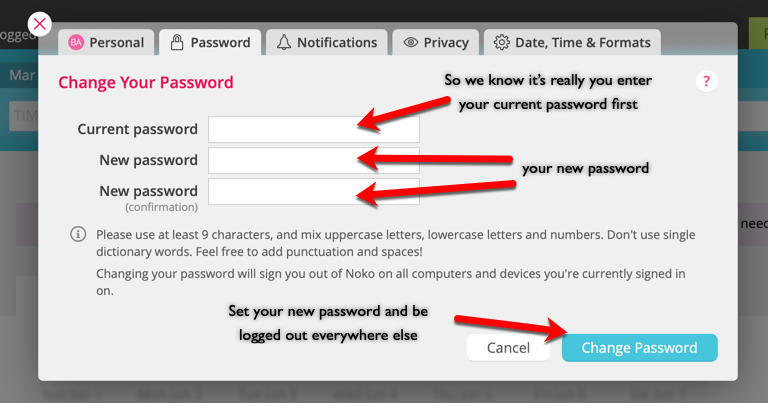 Just enter your email and password on the sign-in page, click Sign In To Noko, and you'll be signed in! If you don't want to type your email and password every time you use Noko, make sure the "always keep me logged in" checkbox is checked (only activate this on computers or devices that only you have access to). Don't panic! You can log out on all computers and devices that you've signed in from by changing your password. First, enter your current (old) password. This is to make sure that it's really you and not someone who just walked by your laptop. Enter a new password and enter it again for confirmation. We've set this form up so it should work with password managers like 1Password or Safari's built-in password management. Click Change Password and your new password will be set—and you will be logged out on every other device you're signed in on. This includes the iPhone app and the Mac app.